Our eco friendly 100% Recycled interleaved multi flat toilet tissue is manufactured by Kimberly Clark from 2 ply soft white paper. This toilet tissue dispenses one at a time from a suitable wall mounted toilet tissue dispenser. Each tissue is individual and being interleaved is presented fully open once dispensed. The user can only pull one sheet at a time making this controlled use product very cost effective with little or no wasted paper. The dispenser will take 2 sleeves of 250 sheets at a time giving 500 toilet tissue leafs from such a small dispenser. The dispenser can also be topped up and any time. 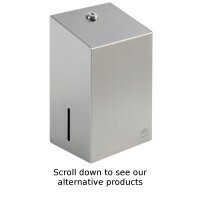 This ensures no wasted paper stubbs as associated with toilet rolls / jumbo toilet roll systems . More hygienic as only one toilet tissue leaf is touched while dispensing. The next tissue is left hanging for the next user. Ideal when you need a recycled soft white toilet tissue product for your washroom with a branded quality.